Russ and Brad (AKA tinman) would like to welcome you to the 2013 pulse motor build off. In the following few post,you will find the rule's and other information regarding the competition. First before you get started please subscribe to this mailing list to keep up to date on this contest!!! A thread will be open with the start of the build off,for progression video's-both on IAEC and Open-source-energy websites. please see links below. 1. You must post a video ( or photos and some text) at the beginning of the build off, and show what setup you plan on building-a. a brief description will do. This is to insure that you are building a new machine, and not just modifying an old one. (Parts from old machines may be used but must be modified extensive). theses videos or photos are to be posted in the threads listed for the entry's. links listed below. 2. There will be two categories, class A. Advanced. and class B. Beginners/use of resources. Russ and Brad will decide witch category you will be in, based on previous builds by yourself/ your entry video. we encourage the beginner's to use there resources. this will help you in your class. Build from junk is good!!! When submitting please label the video and post titled "PMBO ENTRY 2013" so we can determine this is your entry. when submitting 'n entry please include your email so we can get a hold of you for questions or concerns. 5. What is a pulse motor???? A pulse motor definition for the build off. A rotating device that turns by pulses. Those pulses are not limited to electrical pulses. It can be gas pulses,liquid pulses,or anything that creates a pulsing force ( most the time repetitive pulses but could be limited to one pulse) that is used to rotate the device's mechanism ,rotor,flywheel ECT. It can be big or small,and made from any material. The wackier and most use of resources the better. Those are the rule's to the build it self. This year there will be no time extensions,but you have just under 4 weeks. So as you can see,the rules this year are very open,and easy. Each will be judging the 2 category. now your asking "BUT what about prizes!!!" we are welcoming people to donate to the build off. below is what we have so far. we hope that there will be more in the future before the build off is complete. prizes will be given to first, second, and third places winners for each category. Russ and Brad will also be picking our favorite entries and giving those winners prizes as well. The smart scarecrow (Gary) will also be awarding the winners there 15 min of fame again on his show for those who want to participate!!! shazizz mad science show will also be giving 15 min of fame on his radio show!! So grab some junk,and have some fun!!! Uh, hummm. Only my wife calls those things junk. Everyone else knows it's really called stuff. I hope this is a decent place to post pictures. I short gathering parts video will come soon. Thanks for your time guys, this looks like fun and a great learning experience. Yep this is the place. :) Can't wait to see what you have planned. :cool: My video is uploading now too, might take a day to get there. My video is uploading now too, might take a day to get there. What's ya building Nate? A Babcock motor? hehe. 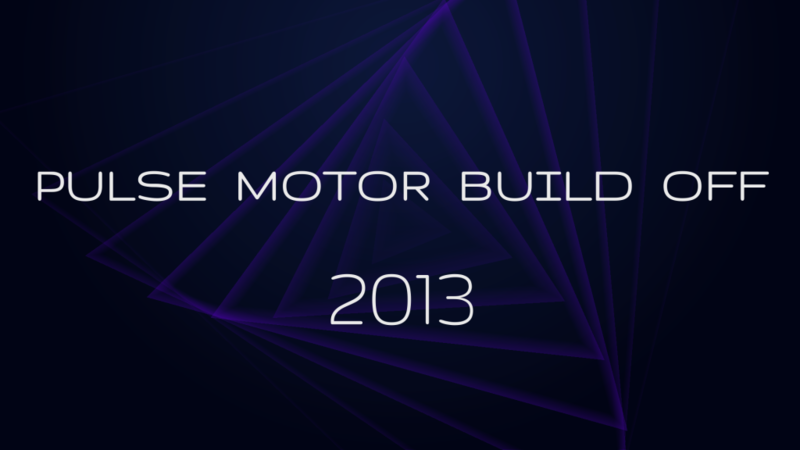 Quick update / Q&A to the pulse motor build off 2013 video! Yep! This is the place! Here we go, we don't have a 3D printer or anything ;) but we have some stuff coming together. I bought some things today and probably spent more money than I should have, but we have been wanting to play with this idea for some time now since our last motor. Its along the lines of Joseph Newman, Tesla, and Bedini's Window motor idea. This looks like a blast and I hope we can share some wonderful thoughts on motor efficiency and application. I hear some one was going with the papp design for there entry. That should be interesting. Looking good over here guys. Hello everyone after a failed first attempt this is the intro to my entry. The rotors only means of support is from a shaft running through the center of a pancake coil (rotor). That shaft is pointed and is attached to a neo sphere above the rotor. The rotor pancake coil will act as a receiver of wirelessly transmitted energy inductively coupled from a transmitter pancake located below the rotor. The rotor will consist of (at minimum) the above mentioned receiver pancake coil and shaft, 4 drive coils, a reed switch, a full wave bridge rectifier and a storage capacitor. Surrounding the circumference of the rotor will be 4 equally spaced magnets that will provide the opposite polarity to the on board rotor coils thus allowing the rotor to spin. When the reed switch is closed by one of the magnets it will short the stored energy in the capacitor to the drive coils thus repelling the opposite polarized magnets and causing rotation. At least that's the plan. :huh: Hopefully it's novelty will make up for it's inefficiency. Not sure if Russ has a prize box thread here?,but we have one at IAEC. I checked out your prize thread. That is very generous of you to donate the oscope. :D I noticed that the link is blank for the post you made "A donation from sonsoftesla.com-it was nearly $1000.00". Mystery donation. I would like to submit my first entry. The idea is a simple one, but it may give interesting results. If I have enough time, I will submit another project that is much more interesting compared to this one. Looking good! Thank your bob for your Donation to the build off!! !